ATLANTA – It’s a total of 791 miles from Plano, Texas to Atlanta, Georgia, site of Super Bowl LIII, but for Plano native and former Plano Senior High school star Rex Burkhead, it the culmination of a long held dream birthed on the athletic fields of Plano and redeemed in the worldwide media crush of reporters and fans. “This was my dream, this is every players dream to play professional football, to play in the Super Bowl, to score the winning touchdown,” Burkhead said while surrounded by hundreds of reporters in an Atlanta hotel room, several blocks from where his New England Patriots will face off against the Los Angeles Rams Sunday afternoon for pro football’s ultimate glory. Joseph Noteboom, a 2014 Plano Senior High graduate, who went to TCU, is a rarely used offensive tackle for the Los Angeles Rams, giving Wildcat alumni players on both sides. While Burkhead played a bit role in last year’s Patriots Super Bowl loss to Philadelphia, he enters this year’s game in a role many of his Maroon and White Wildcats fans at Plano came accustomed to seeing at his Collin County home, as a star and key contributor. In the AFC Championship game in hostile territory in Kansas City, Burkhead not only scored the tying touchdown, but the winning touchdown in overtime to advance the Patriots to the Super Bowl for the third year in a row. “Sure, I know I scored. I knew where I was, I knew what it meant and I knew we got to play one more game,” Rex Burkhead said about his overtime NFL score, but was likely using the same quotes he said during his Plano HS days in one of the many Wildcat wins. Burkhead is in his 22nd year of team football, but while he earned the same starring role at Plano, then in college at Nebraska and a NFL journey which includes four years in Cincinnati and now two in New England, he still stays close to hometown roots. His father, Rick, a former college football player, and his family still live in Plano and that is where Rex and his wife Danielle, plus their new baby, make their off-season home. His good friend and starting quarterback when he played at Plano, Carson Meger, is now on the coaching staff for the Wildcats, and Burkhead is as comfortable rattling off Wildcat football stats as he is his own in the NFL. After resting his body from the rigors of another NFL season, Burkhead always makes it a practice to return to the Plano Senior High School practice facilities to work out with buddies from when he played and help encourage the new generation of Wildcat athletes. 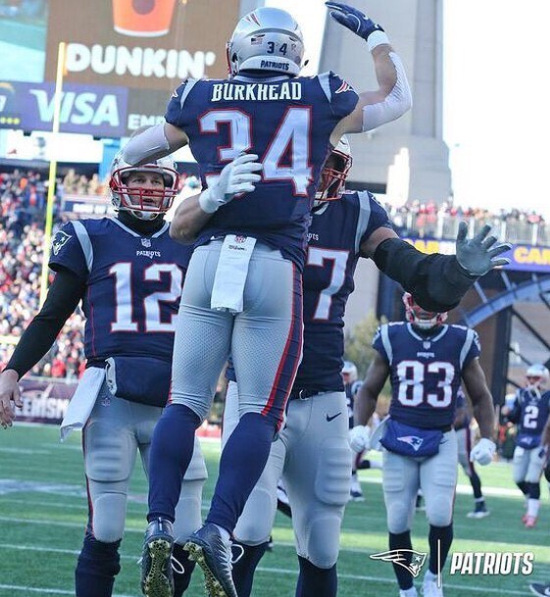 Burkhead is only the second Plano Senior High School player to have played in the Super Bowl, joining Los Angeles Rams defensive back Pat Thomas, who started for the Wildcats in the 1970s and played in the 1980 Super Bowl. Billy Ray Brown, another Plano Senior High star from the ‘70s, just missed by a single year while playing for the San Diego Chargers in the final game. Since scoring New England’s final two touchdowns to ensure them another Super Bowl appearance, Burkhead said he has been overwhelmed by the number of former teachers, players and fans who have reached out to him, thanking him for carrying the Plano football banner on a worldwide stage. For the player known locally as Superman in his high school days, it’s probably not too much to expect for him to emerge in football’s biggest game this weekend. But the humble star said he will never overlook his local roots. Decades of experience, hundreds of golf and writing contacts and plenty of successful written work experience, have made award-winning author Art Stricklin one of the most successful golf, book and travel writers in Texas and the U.S. The Founder and President of Stricklin Free-Lance & Books recently published his 10th book on the history of the nearly century-old Dallas Athletic Club. The former president of the Texas Golf Writer Association has also published books on the historic Northwood Club in Dallas, site of the 1952 U.S. Open, the EME Aircraft factory in California, From Hacker to Hero on using business principles in golf, along the definitive book on Texas Golf History titled: Links, Lore and Legends, The Story of Texas Golf. Nelson to Lee Trevino, who wrote the forward and preface to his Texas golf history book, along with Ben Crenshaw plus rising stars like Rory McIlroy, Hunter Mahan and Jordan Spieth. His work has been published in hundreds of national, regional and international publications including Sports Illustrated, Golf Connoisseur, Texas Monthly, American Way, Global Golf Post, D Magazine, Texas Golfer, Reuters, The (Chinese) People Workers’ Daily, the British Open Program, R&A Yearbook and Augusta National Golf Club. He has won dozens of awards including Texas writer and story of the year and a nomination for the Pulitzer Prize in Public Service. He lives in Plano with his wonderful wife and two great daughters and continues his writing, travel, editing and public relations career.